Whether you’re voiding a payment or issuing a refund, AffiniPay provides the tools you need to manage your transactions. After one day, you can issue a refund, for the full payment or a partial amount, for up to six months from the time the transaction was run. Funds are easily returned to the cardholder based on the original transaction. 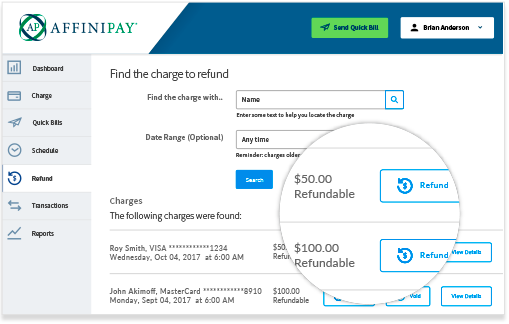 When you issue a refund, the refunded amount is reported and linked to the original payment in your AffiniPay account, establishing a direct payment history and updated balance, for simple reconciliation.